Each week, Chopped provides unique baskets and backstories on the chefs brave enough to test their skills in the Chopped Kitchen. We recently reached out to Chopped Champion Silvia Baldini to learn about how her Italian upbringing and background as an art director led her to become a professional chef. SB: Cooking is in my DNA. I was born in Torino Italy, and my parents instilled my love for food and eating from day one. My career in the kitchen started under the table of my mom and grandma, it was child labor really 🙂 and it evolved through the years until I graduated from Cordon Bleu, and I became a professional chef. What is the one item in the kitchen you can’t live without? SB: My number one item in the kitchen is definitely scissors! I hate opening packages I have zero tolerance and patience for opening tightly closed and wrapped objects and boxes. FP: Tell us about your experience on Chopped. What was the hardest ingredient to work with? SB: Chopped was awesome. The hardest ingredient I had to work with was for sure, the green fondant in the main course round. It went in the garbage!!! Yuk. The caramelized onion in the appetizer basket was pretty nasty too, but I used it in the sweet and sour sauce of the noodle dish. FP: We love the concept of Strawberry and Sage. How did the idea come about? SB: I was an art director for 17 years and then became a chef. I love combining my art background and experience in advertising with food. While cooking is my obsession, I also love working on projects that use both skills. I’m in fact writing my first cooking book and it’s going to cross over and touch both worlds. FP: That sounds like an interesting cookbook for sure! What are some of your favorite meals to cook for yourself at home? SB: At home I keep it simple. I love meals that use local and full of flavor ingredients. Food that you can share with many, as we always have guests, friends, and family coming and going. A bolognese goes a long way! FP: The more the merrier, that’s for sure! When you go out to eat, name some of your favorite places in CT or other places you’ve visited. SB: I eat out a lot!!! I’m lucky to live in CT. So much good food and talent. I love anything by Bill Taibe, Bar Sugo, Locali, South End and Elm. I just had a great dinner at Vespa in Westport. The skirt steak at Tequila Mockingbird is awesome by the way. I have been meaning to stop by at Fortina and eat Chef Adam‘s food. I also love having cocktails and appetizers in summer in Rowyaton at the Seafood Restaurant . FP: Sounds like we have to visit New Canaan for some good eats! Also, we’ve been to Fortina in Armonk and our meal was delicious! SB: I have many guilty pleasures. A perfect bite of parmigiano, poached eggs, I love Eggs!!! Bread and olive oil, the good kind, home made peach jam from the jar and my mother in law focaccia stuffed with prosciutto and fontina, gelato from Gelatissimo in New Canaan, gianduiotti from Torino. Shall I go on? Name three people you would like to cook with in the same kitchen and tell us why. SB: I would love to put all the women that meant and mean something to me, in the same kitchen and cook with them. From my mother, grand mother, mother in law, girlfriends, the women in food that inspire me constantly and my daughter too. Add Julia Child in the mix, even if, someone just told me she is too cliché. Screw that, she always will rock my world. We would share ideas, wisdom and recipes. That would be one hell of a meal and bitching session! FP: What an inspiring list! What are your non-cooking interests and hobbies? What’s a day off like for you? SB: My husband and I train for triathlons as an excuse to eat freely and often. I also read a lot, and love spending time with my two kids and family! FP: Triathlons and food- what a great trade-off! Thank you again for your time. It’s been such a pleasure getting to know you! SB: Thank you so much!! I hope to meet you soon and cook for you, in fact I’ll invite you to my annual garden pig roast this summer! 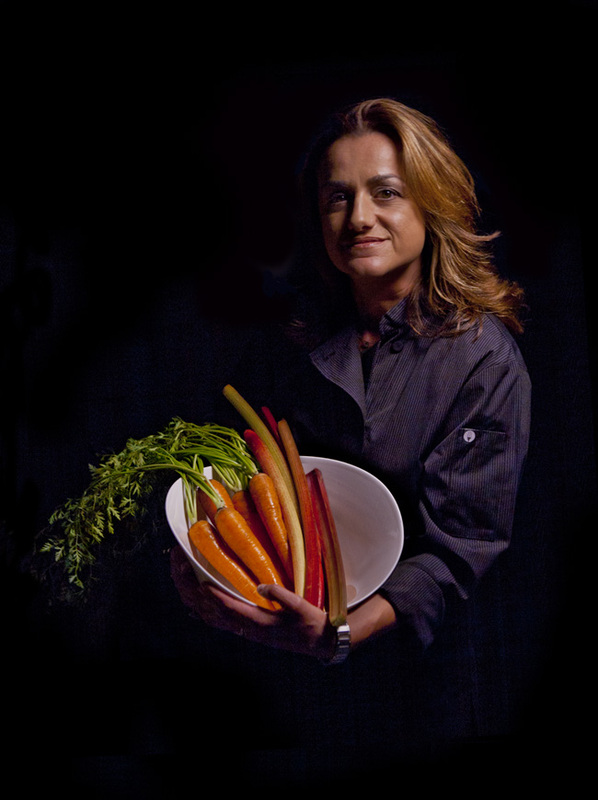 For more on Chef Silvia, check out her website: http://www.silviabaldini.com/!